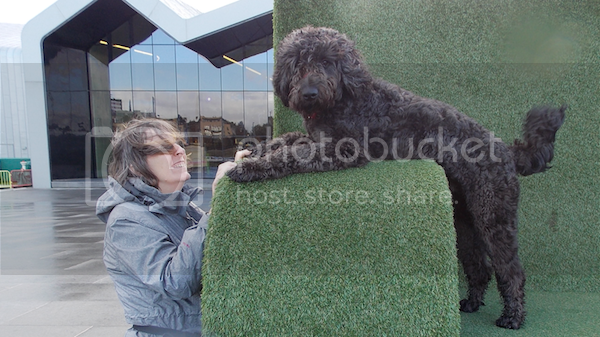 UK Labradoodle Association • View topic - Four weeks in! Post subject: Four weeks in! Well, we have now had Luna for a month and it has been a fun but challenging and exhausting time! We always had Golden Retrievers before and in the main they have been laid back and easy puppies. We decided on a change when we lost our two Goldies to old age and didn't want to be comparing a new pup with them. Luna is adorable, but oh my is she hard work!! She is on the go from the minute she wakes up with a little break here and there and as I believe is common, has a burst of energy between 6-8pm when she is totally over excited, charging round the house and garden, running off with anything we have left about and on occasions needing time out to calm down. She gets so over excited when playing that she forgets anything she has learned and reverts to hard mouthing and if she is told off - barking to get the last word - which she doesn't! We have tried a water spray ( loves it) shaking a tin with gravel in ( loves it again) and the pet corrector spray (loves it again). The only thing that seems to stop her in her tracks is a very loud "no" and if she persists ignoring her. She hates being left alone and still objects loudly if we put her in her crate and we usually come back to find she has thrown her water bowl all round the crate in protest. She loves a frozen Kong though. We bought a couple of puzzles but she solved them in about 5 minutes flat. She is very focused when we do some training with her and will sit, sit stay, down down stay, and is pretty good at retrieving, she wants to be entertained all the time! I'm guessing she is pretty intelligent and will be better once we start training in earnest in a week or so. She is extremely nosy and always seems to be interested in what is going on around her. Nothing seems to faze her (except possibly the car journeys). She loves chasing the vacuum, adores visitors and is not at all bothered by loud noises etc. She went for her last injection on Tuesday and was impeccably behaved, sitting on the scales and on the couch to be examined and the vet couldn't believe what a holy terror she can be! We are SO looking forward to getting her out and about next week. She is a bit of a picky eater and can take or leave her food - but loves treats of chicken pieces and apple. Nevertheless she is gaining weight and has more than doubled since we got her, the vet thinks she will be quite big. She is struggling with the heat and I have been trying to keep her inside during the hottest part of the day as she has such a thick coat. She enjoys the hosepipe when she needs to cool off. Our garden is destroyed - plants/grass dug up, pots flattened and grass mottled with lovely yellow patches - housetraining is hit and miss - I think because we have had the doors open in the heat and she doesn't really differentiate between inside and outside. She goes through the night now, and sleeps soundly next to our bed! Maybe some of you experienced Doodle owners can throw some light on how long this mad as a hatter stage lasts? My daughter has a 5 year old Doodle who is very ladylike and certainly wasn't anywhere near such a handful as a pup. We are quite besotted with her and she is certainly a character - but needs a firm hand! Post subject: Re: Four weeks in! This was like reading the story of our Flo when she was a pup!! 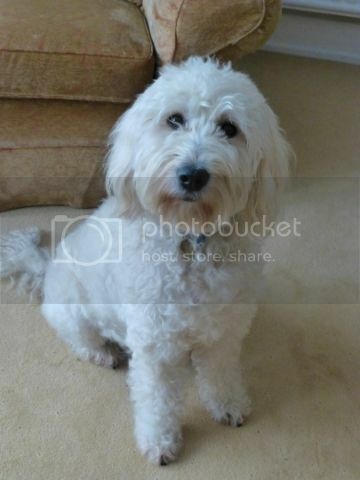 We too always had golden retrievers before having labradoodles and were taken aback when we had Flo. She was such a naughty puppy! I'd had dogs all my life and was always hot on training from the word go but we really had our work cut out in the early days and I wondered if I'd done the right thing changing breeds. Fast forward a few months and lo and behold a light switch turned on. Flo suddenly 'got it' and became the most delightful, laid back, friendly, responsive dog we'd ever owned. She is now a PAT therapy dog has had a litter of pups and her daughter Ruby has followed in her pawprints and is also a smashing dog. I wouldn't change them for the world! 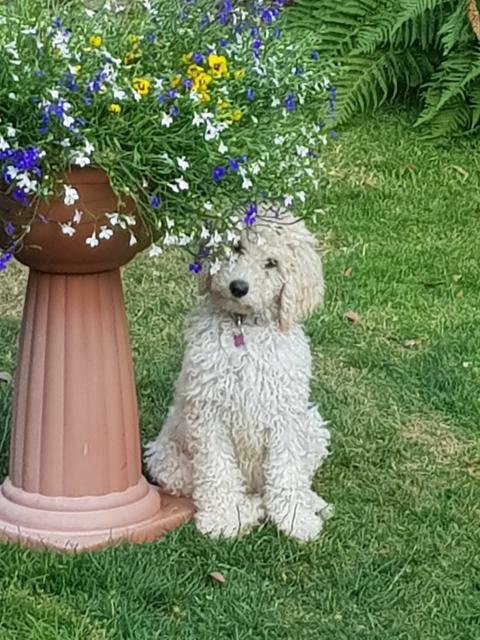 I think Labradoodles are sooo intelligent and have that extra personality which sometimes can be a challenge when they are young a but ultimately are incredibly loyal and just want to please. Stick with it....it will get better honest.... Funnily enough Luna looks very much like my Flo did at that age...butter wouldn't melt! Look forward to hearing how things are going. I'm sure they'll improve soon ...and by the way Congratulations on joining the mad world of Doodles!! Oh thank you SO much! Yes I consider myself an experienced dog owner and spend a lot of time trying to get into my dogs' heads! Your Flo does look very like Luna - you have given me hope! We are very consistent and are hoping she will calm down eventually. My old Goldies would be horrified! She is such a messy mutt - frequently covered in earth and bits of shrubs. She is going to the groomers next week for a tidy up - that should be interesting- i brush her every day but she always ends the day a mess! I definitely think she will be much easier after proper training sessions - hope we dont get banned! If its any consolation, we did get banned from puppy classes!! Well, not actually banned...but they were a nightmare and Flo hated them. Too many other puppies too play with, too many treats, too hectic, and having to wait your turn to have a go at the task of the evening! She would frequently be sick all over the hall floor too with the excitement/stress of it all! I gave up after a few weeks and just concentrated on lots of one to one training and socialising her with friends dogs and children. Much more successful and less stressful for me too! I think you are doing exactly the right thing about just being really firm with Luna, that was the only way Flo took any notice at all. Yes everything seems to be a game with them doesn't it. So Frustrating!!! 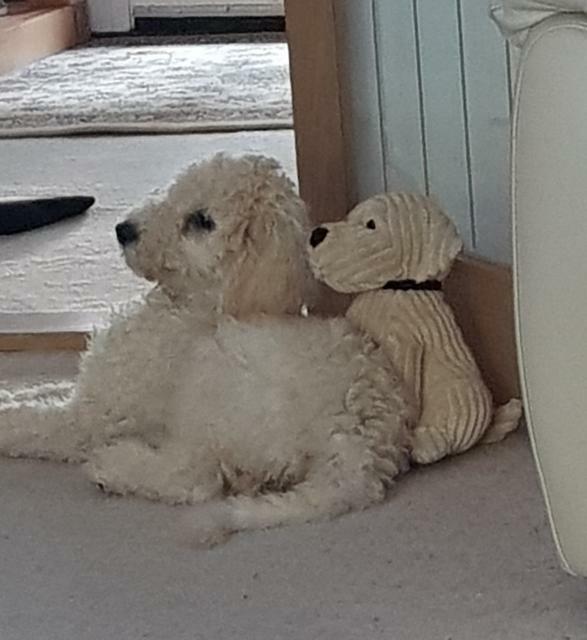 I started up the Surrey Strollers Labradoodle dog walking group with her as I wanted to meet other people with doodles and it was the best idea. I've met loads of lovely people over the years and have made firm friends with both humans and their lovely Doods. It's a really good way of finding support and a sympathetic ear and the dogs just love seeing their friends!! A bit like joining your local NCT group when you have a baby!!! Thank you all for the reassurance. This week Luna has been out into the big wide world. We have visited the shop/pub/park/pets at home and she was an absolute dream! Trotted like a dressage horse, gathered many fans and was a pleasure to be with. Still having the doodle dashes in the evening but much calmer after walks. We are struggling with wee accidents in the house., though she always does the other outside. Still I feel we have made progress! It will come, you will find when she goes out, she will see other dogs weeing outside and will copy them, or smell where they have weed and then do it.